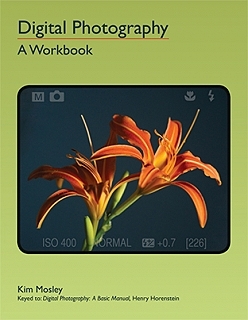 Digital Photography: A Workbook by Kim Mosley, keyed to Digital Photography: A basic Manual by Henry Horenstein, will strengthen one's understanding of the craft of digital photography. It includes assignments for a one-semester course. Like the Workbook for Black and White Photography, which has been used for 33 years in various editions, this book has been designed to help students learn to read and understand a technical manual. The workbook is especially useful either for weekly assignments or as a supplement to initiate discussions and pinpoint difficult concepts or techniques that need further attention. Try the workbook and see the difference it makes in your students' understanding.